With using webhooks, you don’t have to wait any amount of time to get the data you need. Webhooks enables you to push data in real-time and sync their applications with UpKeep as events are taking place within their account. For example, for every work order that is closed, the total cost can be sent to Quickbooks as soon as the work order status is changed to “Completed”. Any event within your UpKeep account can trigger the sharing of your data in an instant! Here's a quick guide on setting up your first webhook. Step 1: Create a "Catch Hook"
This will be the endpoint which will get triggered by events and sent your event data. This can either be a custom endpoint that your engineering team creates or you can use a more simple solution like Zapier to help create one. 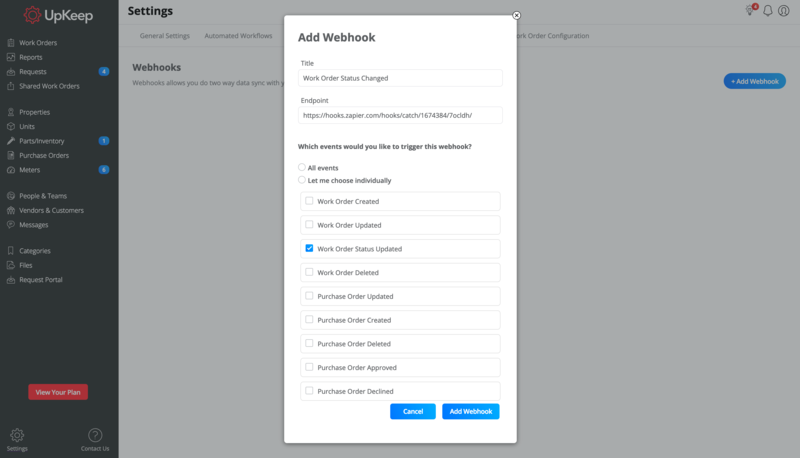 Navigate over to the settings page in UpKeep and select "Webhooks"
On this page, press the "Add Webhook" button! You'll create a title, and then select "Let me choose individually"
Step 4: Paste in the URL from step 2 into the "Endpoint"
From here you'll then want to create the webhook, and then click in and press "Enable". Once the green light is on, you know your webhook is up and running! Now that you've created a webhook every time a work order status has been updated, let's go ahead and change the status of a work order to see if data is getting sent over! Now every single time a work order status is updated, the URL endpoint will be sent data about that work order. This will then enable you to do things like create better two-way integrations with different applications! 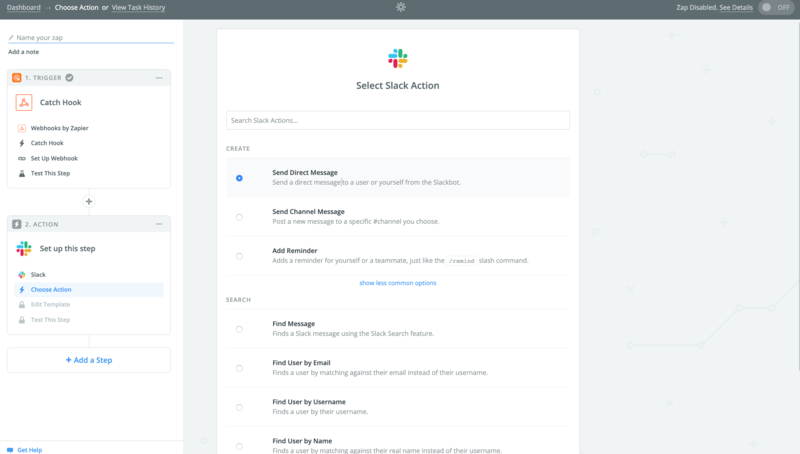 One simple thing you can do is send a slack message each time a work order status has been changed! Good luck using webhooks! We'd love to hear from you!